Will Yellen and the Federal Reserve Sabotage Trump? Home » Will the Federal Reserve Sabotage Trump? Will the Federal Reserve Sabotage Trump? Is the Fed trying to throw a wrench into Donald Trump’s plans for the economy? The idea is far from a conspiracy theory. 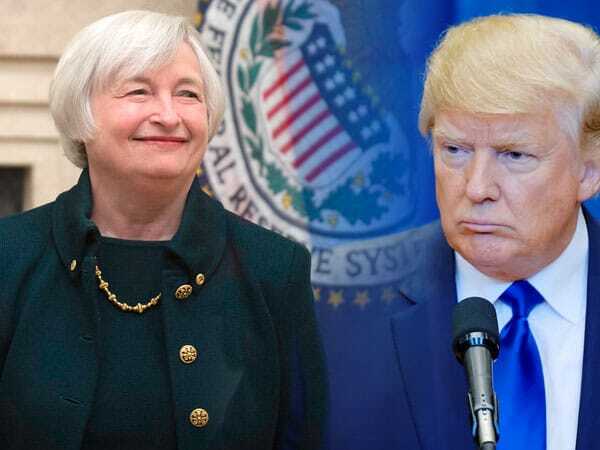 Trump’s rivalry with Fed chairwoman Janet Yellen is widely known, and she has the power to sabotage the economy while leaving him holding the bag. But even if the fallout from their battle puts a damper on the market, gold owners could potentially take advantage of the situation and come out ahead. Trump has always been a critic of the Fed, and now it looks like he’s ready to face the central bank head-on. He’s already planning to restructure the Fed by filling two empty seats on the Board of Governors, which was kept empty until now by political roadblocks, and he’ll have the chance to go even further with the appointments of the Fed chair and vice-chair coming in 2018. On top of that, he has shown indication in the past that he may support the notorious ‘Audit the Fed’ bill, which is strongly opposed by Fed officials and could change how the central bank operates. With Republicans controlling both Congress and the Senate, and Trump’s potential support from the White House, the bill has a fighting chance to become law for the very first time. All things considered, Trump is giving the Fed plenty of reasons to launch a counter strike, which could spark a messy fight that threatens the economy once he takes office. The Fed doesn’t have much to lose by retaliating against Trump’s advances. Economic problems tend to get pinned on the president, not the central bank or its leaders. That means Fed bureaucrats could deliberately derail the economy for no other reason than to sabotage Trump’s presidency. Interest rates are the weapon they would use to do it. Americans were already shocked last December by the Fed’s unexpected plan to raise rates three times in 2017, which halted the “Trump rally” in stocks and put many investors on edge. Who’s to say Fed officials won’t abuse their power to attack Trump and do it again? A decision to raise rates at an even faster pace could nullify any benefits caused by Trump’s stimulus plan, and possibly even push the economy back into recession mode, thus threatening Trump’s chances of reelection four years from now. Fed officials may claim their motives to be pure – that they’re raising rates in response to inflation – but without the bill to audit the Fed, government officials can’t truly hold them accountable. So, if Trump’s quest to reform the Fed moves forward, Yellen and her colleagues could easily exploit their authority just to settle their personal vendetta. Could the economy be left as collateral damage? With tensions mounting between Trump and the Fed, there’s certainly a chance that the situation will not diffuse itself without causing some form of economic damage. Of course, you don’t have to sit on the sidelines and hope that that damage doesn’t decimate your savings. There’s a cunning way Americans can harness the power of this political grudge match to build their wealth. The strategy is surprisingly simple, and it all boils down to simple economics. Historical data shows that when the market starts receding – as it may when punches start flying between Trump and the Fed – real assets like gold flourish. Some Americans are well aware of this basic rule, and it’s one of the reasons they’re taking this opportunity to pile into gold. Now might be a good time for the rest of us to consider doing the same.